«The country-game» illustrated quotation. Refugee Day, free quote pictures for Facebook, Twitter, LinkedIn, Reddit, Pinterest and other social networks. 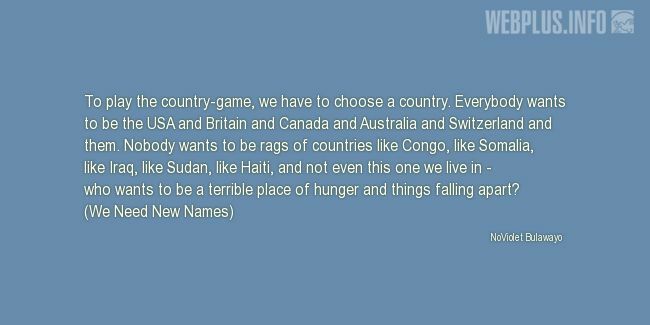 To play the country-game, we have to choose a country. Everybody wants to be the USA and Britain and Canada and Australia and Switzerland and them. Nobody wants to be rags of countries like Congo, like Somalia, like Iraq, like Sudan, like Haiti, and not even this one we live in - who wants to be a terrible place of hunger and things falling apart?